Neural prosthetic devices implanted in the brain's movement center, the motor cortex, can allow patients with amputations or paralysis to control the movement of a robotic limb—one that can be either connected to or separate from the patient's own limb. However, current neuroprosthetics produce motion that is delayed and jerky—not the smooth and seemingly automatic gestures associated with natural movement. Now, by implanting neuroprosthetics in a part of the brain that controls not the movement directly but rather our intent to move, California Institute of Technology (Caltech) researchers have developed a way to produce more natural and fluid motions. 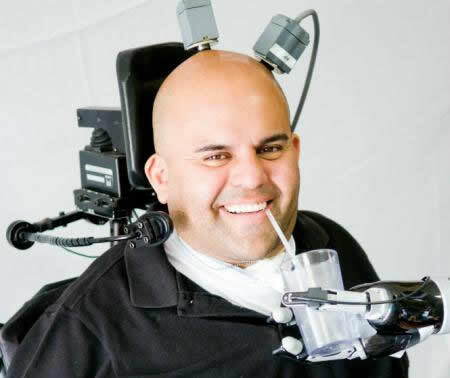 In a clinical trial, the Caltech team and colleagues from Keck Medicine of University of Southern California (USC) have successfully implanted just such a device in a patient with quadriplegia, giving him the ability to perform a fluid hand-shaking gesture and even play "rock, paper, scissors" using a separate robotic arm. The results of the trial, led by principal investigator Richard Andersen, the James G. Boswell Professor of Neuroscience, and including Caltech lab members Tyson Aflalo, Spencer Kellis, Christian Klaes, Brian Lee, Ying Shi and Kelsie Pejsa, are published in the journal Science. "When you move your arm, you really don't think about which muscles to activate and the details of the movement—such as lift the arm, extend the arm, grasp the cup, close the hand around the cup, and so on. Instead, you think about the goal of the movement. For example, 'I want to pick up that cup of water,'" Andersen says. "So in this trial, we were successfully able to decode these actual intents, by asking the subject to simply imagine the movement as a whole, rather than breaking it down into myriad components." The recorded signal is then carried via wire bundles from the patient's brain to a computer, where it is translated into an instruction for a robotic limb. However, because the motor cortex normally controls many muscles, the signals tend to be detailed and specific. The Caltech group wanted to see if the simpler intent to shake the hand could be used to control the prosthetic limb, instead of asking the subject to concentrate on each component of the handshake—a more painstaking and less natural approach. Andersen and his colleagues wanted to improve the versatility of movement that a neuroprosthetic can offer by recording signals from a different brain region—the PPC. "The PPC is earlier in the pathway, so signals there are more related to movement planning—what you actually intend to do—rather than the details of the movement execution," he says. "We hoped that the signals from the PPC would be easier for the patients to use, ultimately making the movement process more intuitive. Our future studies will investigate ways to combine the detailed motor cortex signals with more cognitive PPC signals to take advantage of each area's specializations." In the clinical trial, designed to test the safety and effectiveness of this new approach, the Caltech team collaborated with surgeons at Keck Medicine of USC and the rehabilitation team at Rancho Los Amigos National Rehabilitation Center. The surgeons implanted a pair of small electrode arrays in two parts of the PPC of a quadriplegic patient. Each array contains 96 active electrodes that, in turn, each record the activity of a single neuron in the PPC. The arrays were connected by a cable to a system of computers that processed the signals, decoded the intent of the subject, and controlled output devices that included a computer cursor and a robotic arm developed by collaborators at Johns Hopkins University. "For me, the most exciting moment of the trial was when the participant first moved the robotic limb with his thoughts. He had been paralyzed for over 10 years, and this was the first time since his injury that he could move a limb and reach out to someone. It was a thrilling moment for all of us," Andersen says. "It was a big surprise that the patient was able to control the limb on day one—the very first day he tried," he adds. "This attests to how intuitive the control is when using PPC activity." The patient, Erik G. Sorto, was also thrilled with the quick results: "I was surprised at how easy it was," he says. "I remember just having this out-of-body experience, and I wanted to just run around and high-five everybody." 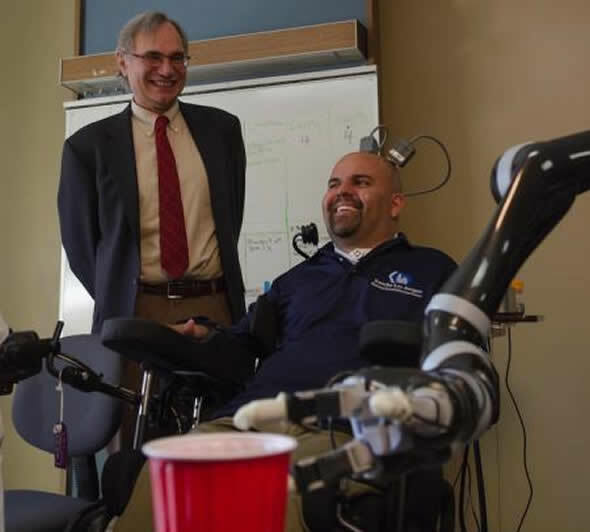 Over time, Sorto continued to refine his control of his robotic arm, thus providing the researchers with more information about how the PPC works. For example, "we learned that if he thought, 'I should move my hand over toward to the object in a certain way'—trying to control the limb—that didn't work," Andersen says. "The thought actually needed to be more cognitive. But if he just thought, 'I want to grasp the object,' it was much easier. And that is exactly what we would expect from this area of the brain." This better understanding of the PPC will help the researchers improve neuroprosthetic devices of the future, Andersen says. "What we have here is a unique window into the workings of a complex high-level brain area as we work collaboratively with our subject to perfect his skill in controlling external devices." "The primary mission of the USC Neurorestoration Center is to take advantage of resources from our clinical programs to create unique opportunities to translate scientific discoveries, such as those of the Andersen Lab at Caltech, to human patients, ultimately turning transformative discoveries into effective therapies," says center director Charles Y. Liu, professor of neurological surgery, neurology, and biomedical engineering at USC, who led the surgical implant procedure and the USC/Rancho Los Amigos team in the collaboration. "In taking care of patients with neurological injuries and diseases—and knowing the significant limitations of current treatment strategies—it is clear that completely new approaches are necessary to restore function to paralyzed patients. Direct brain control of robots and computers has the potential to dramatically change the lives of many people," Liu adds. Dr. Mindy Aisen, the chief medical officer at Rancho Los Amigos who led the study's rehabilitation team, says that advancements in prosthetics like these hold promise for the future of patient rehabilitation. "We at Rancho are dedicated to advancing rehabilitation through new assistive technologies, such as robotics and brain-machine interfaces. We have created a unique environment that can seamlessly bring together rehabilitation, medicine, and science as exemplified in this study," she says. Although tasks like shaking hands and playing "rock, paper, scissors" are important to demonstrate the capability of these devices, the hope is that neuroprosthetics will eventually enable patients to perform more practical tasks that will allow them to regain some of their independence. "This study has been very meaningful to me. As much as the project needed me, I needed the project. The project has made a huge difference in my life. It gives me great pleasure to be part of the solution for improving paralyzed patients' lives," Sorto says. "I joke around with the guys that I want to be able to drink my own beer—to be able to take a drink at my own pace, when I want to take a sip out of my beer and to not have to ask somebody to give it to me. I really miss that independence. I think that if it was safe enough, I would really enjoy grooming myself—shaving, brushing my own teeth. That would be fantastic." Although Sorto's implant allowed him to control larger movements with visual feedback, "to really do fine dexterous control, you also need feedback from touch," Andersen says. "Without it, it's like going to the dentist and having your mouth numbed. It's very hard to speak without somatosensory feedback." The newest devices under development by Andersen and his colleagues feature a mechanism to relay signals from the robotic arm back into the part of the brain that gives the perception of touch.